!!!!! Wow… It’s been quite some time that I came across a book this awesome. Okay, I had some troubles with the misleading first chapter. Cause in what world would it be possible for a drunk person that causes a deadly accident to walk free, to not be punished for his actions? I mean, he just killed someone! No, this world focuses only on the fact that he was “saved” by his Guardian Angel. And he was only saved because he paid a heft sum of money, not because he’s a safe-worthy person. There’s not even an investigation or an arrest, no! Instead he’s suddenly the most”wanted” person…. for talk shows and such! What about the family of the person that was killed? Isn’t that unfair? I know this is a bit of a rant, but this was the only part of the world that Scott Speer build that I had trouble with. He did something wrong, so he has to face the consequences… and he definitely should not be treated like he did something amazing! And people should not be saved, simply because they have the money, but because they deserve it! Fortunately that was only the first chapter, it became way and way better afterwards (except for buying Guardian duty….). 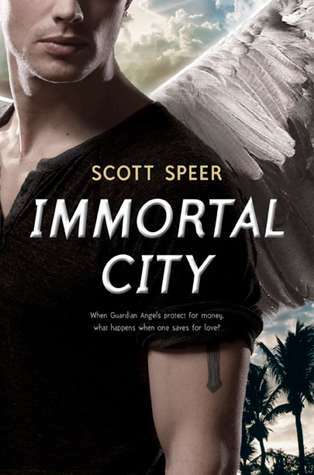 There’s a highly detailed and explained Angel Society, history included. We’ve got Angels who, for a change, act more like humans than the distant powerful beings I always thought they should be. They’re even celebrities! *Sigh* How amazing it wouldn’t be to see one in real life, flying through the sky, with wings spread wide…And it all fits so wonderfully, the angels, the humans, the whole alternative history, like it really could have happened! Epic world-building! And the story! The action scenes were written in such a way that I had a hard time getting my heart out of my throat. It was created so well, you really could feel the angst and uncertainty. Everything was possible. Just thinking about those scenes, now, days after I’ve read the book, gives me a new adrenaline boost. And makes me want to reread the entire book. Amazing! I’ve never read a book I was this involved with, that kept me thinking about the story for so long afterwards. I didn’t even skip to the end to know who the villain was (not a great trait, I know, but I’m not good with not knowing…). In the end it was one big surprise. Totally unexpected, even with all the possibilities I came up with (and that were a lot, believe me, I’m very open-minded 😉 ), I still did not guess the right one. This story just kept pulling me in from the first page and stayed thrilling, till the last page. What a book! Oh let’s not forget Maddy, our heroine! She’s this lovely down to earth girl, who can think before she acts. And she’s definitely not a damsel in distress. Exactly how I like my main characters. And with her visions she makes it even more interesting. What is real and what not? It’s was so hard to see the difference, which made reading this book even more like riding a rollercoaster. I can’t even count the times I thought a scene was real, to sigh in relief and exasperation that it was, once again, not. Another sign how this story had me totally captivated. How could I otherwise forget she had this power and fall for it, again and again? This sounds great! engrossing, compelling, a real page-turner! Would you be interested in blurbing your review over at Bookstore Bookblogger Connection? We’re really in need of more YA titles in our database. It totally is and I don’t mind blurbing. What do I need to do? I’ve been wanting to read this book for so long! Thank you for the lovely review. Will definitely try to get to reading this soon! Will add this to my reading list. Great review! Next Next post: Blog Tour: The Tale of Mally Biddle Blast & Giveaway!